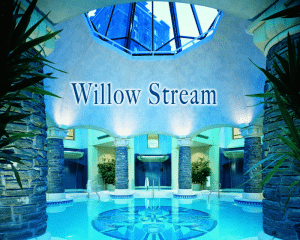 Rated one of the top 3 spas in North America, you receive the most regal of personal treatment at the Fairmont Scottsdale Princess’ Willow Stream spa. The body wraps feel like you are in a down cocoon, rather than the customary saran wrap and the facials feel like a whole body experience. On a cold day in December, with the sound of rain pelting on the roof, behind the soft music, I was actually happy not to be on the golf course. Make time for the greatest assortment of facility rooms, including the standard dry and steam sauna. The Jacuzzi has a stream of water that can cascade down one wall and the optional cool plunge right next to it so you can alternate between relaxation and invigoration. The Inhalation Room is a new experience. It is dimly lit but you can still see to read. The comfy seating includes puffy cushions for your preferred positioning. The soft red tone walls are accented by sparse but substantial pottery. At room temperature, you breathe in the light essence of eucalyptus on your own terms as opposed to the usual blasting in the steam room – a completely soothing environment.